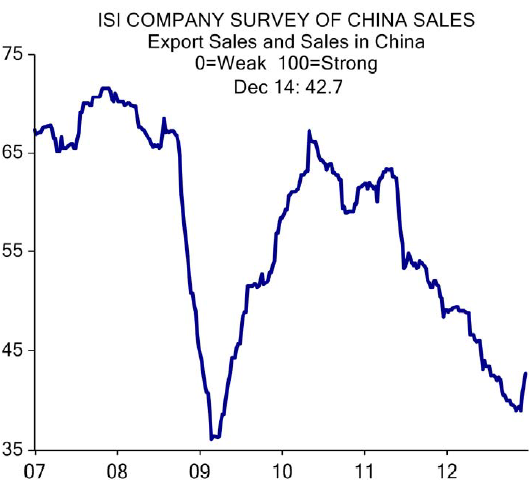 On page 4 of this publicly available ISI report (here) from September, there is a chart of the ISI company survey of China sales (US companies exporting to or selling in China). The comment says: "Our China Survey was unchanged this week, but is just 4 pts off the 2009 low" - as the index approached its all-time low. It never quite made it. In a remarkable turnaround, the index (according to ISI) has its biggest 3-week increase in 3 years. There is clear evidence of this improvement from companies like Yum Brands, who saw large declines in China sales that are now expected to stabilize (see Barrons post). This provides further support to the thesis that China's economic output growth has bottomed (see discussion).